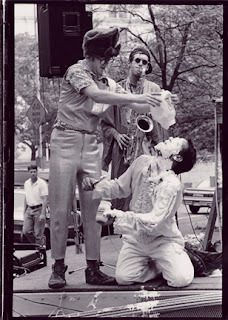 Gypsy Scholar: Jim Pirtle: NoZe Brother and Performance Artist - or is that redundant? Jim Pirtle: NoZe Brother and Performance Artist - or is that redundant? Jim Pirtle was born in Houston, TX in 1960. In High School he was selected "Most Nonconformist." He went to Baylor University in Waco, TX and received a BA in history but more importantly was a member of the NoZe Brotherhood. The group was an underground mask-wearing secret society of satirists that through writing, campus interventions and performance art exposed the hypocrisy of conservative Baptists. In one psychological experiment examining fight or flight responses to electric shock, it was found that one rat in a cage would escape when possible. Two rats in one cage with no escape would fight each other. One rat in a cage with no way out and no one to fight would turn his fight instincts onto himself, weaken and die. When I worked in the Austin State Hospital in Austin, TX, I saw a lot of rats in a no escape cage who were so drugged they couldn't fight. I found one patient who drew all day as a way of fighting his demons instead of himself. I became his friend and advocate. I did a lot of reading about mental illness and began to wonder if the individual's response might be a perfectly sane response to a society gone mad. When I left there I decided to make art, my escape into the safe cage. Good call there, Pirtle! I wonder if you remember me . . .